Duncan at work in the cotswolds. 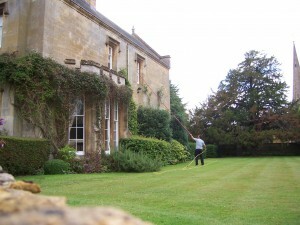 Hard work in the most beautiful surroundings makes window cleaning worthwhile. It beats working in a warehouse during the summer hands down! Doing a professional job safely and keeping your surroundings free from damage to grass and established shrubs is another benefit to using water fed pole window cleaning equipment, your customers are happier too!! Best job in the world? Well in the summer sure!